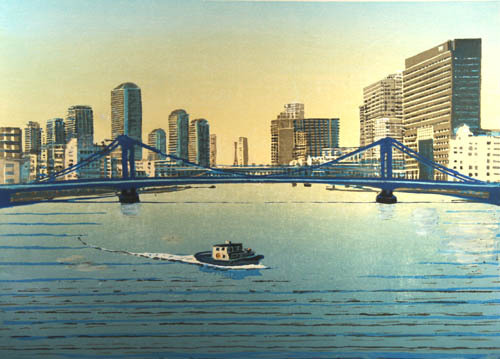 This week we'll look at the work of Mototsugu Sugiyama, a late 20th century artist who made woodblock prints of many Sumida River Crossings. The picture above is of the Kototoi Bridge (a three span haunched steel girder bridge) just downstream for the Sakura Bridge. 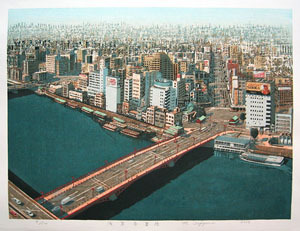 The elevated Metropolitan Expressway can be seen on the east bank of the Sumida River. Continuing downstream we arrive at the bright blue Kiyosu Bridge, a three span self anchored steel link suspension bridge. Looking south, we can see the elevated Metropolitan Expressway and some tall two-tone apartment buildings in the background. Continuing south we arrive at the Eitai (through arch) Bridge with the Chuo (cable stayed) Bridge to the west in the background. 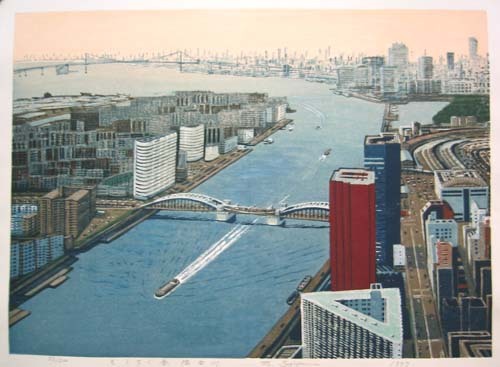 The apartments we saw in the previous print are closer and we also see the canals and artificial islands that interrupt the Sumida River at this location. 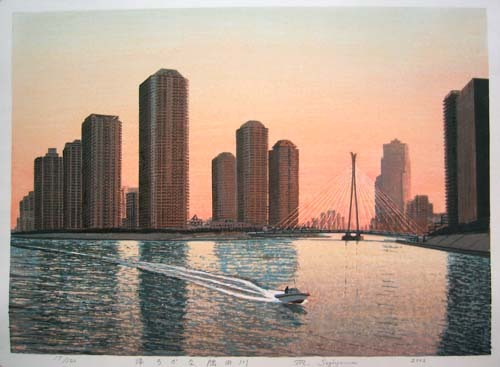 Continuing downstream we get a closer look at the apartments (on an artificial island) and of the Chuo Bridge (above). Continuing downstream (below) we see the Kachidoki (lift) Bridge with Tokyo Bay and the Rainbow Bridge in the background. 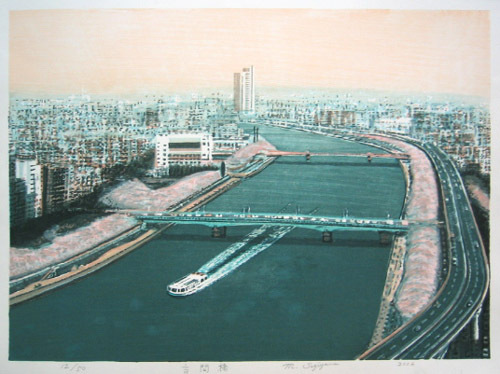 In this brief survey of Mototsugu Sugiyama's art we get some excellent examples of his use of color to capture the way light is reflected on the Sumida River. 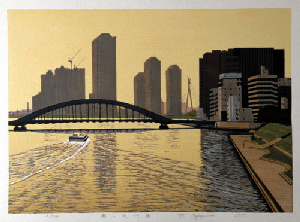 Sugiyama strikes me as a true successor to Kobayashi Kiyochika whose use of light, shadow, and perspective brought traditional Japanese woodblock printing into the 20th Century. Thanks again. I had booked a trip to Japan in 2114, scheduled for just after the tidal wave of that year. I had to cancel and took a "bridging" trip to New Zealand instead. Maybe someday. . . .